If working with this blog for almost three years has taught me anything, it’s that there are no geographic restrictions on the origins of great music – you never know where your next favorite band/artist might come from. This goes for the usual suspects, as well as some more ‘exotic’ places we don’t usually connect with certain types of music. Case-in-point: Labirinto, whose music exists at the fiercely bleak crossroads of doomgaze, sludge, and post-metal, come from the vibrant city of São Paulo, Brazil. Having formed in 2005, these guys have been at it for thirteen years now, bringing their potent murky atmospheres to a dedicated audience over two full-length records and a number of EPs and split releases so far. 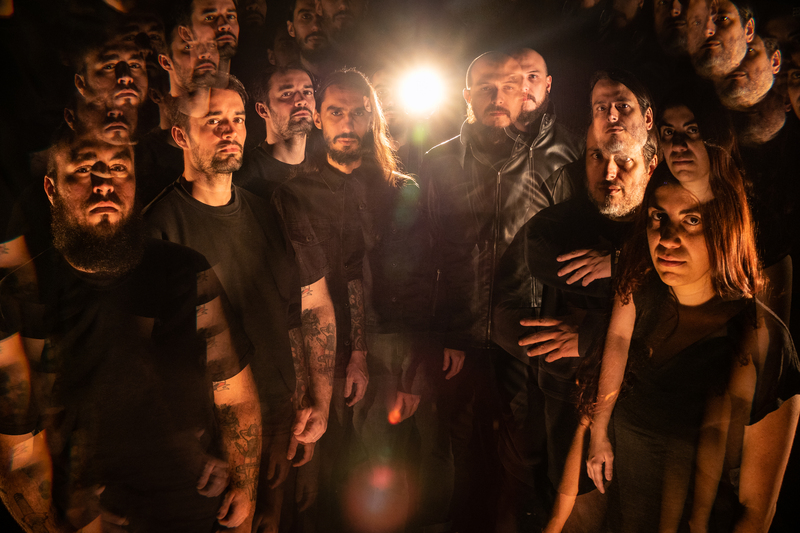 Backed by German post-metal label extraordinaire Pelagic Records, the Brazilian six-piece are gearing up to unleash their third album Divino Afflante Spiritu (produced by one Magnus Lindberg of Cult of Luna fame) in February of next year. À propos of nothing, Divino Afflante Spiritu shares its name with, of all things, a papal encyclical letter issued by Pope Pius XII. back in 1943, in which he expressed the wish for new Bible translations being sourced from the book’s original languages instead of further using the late 4th century Latin Vulgate translation as the foundation, as well as permitting the use of textual criticism and the historical-critical method in biblical studies for the first time in the church’s history. Neat, huh? The more you know! Anyway, we are very happy to premiere the official video for the record’s title track for all you wonderful people. Labirinto have always known how to properly construct an atmosphere, so it should come as no surprise that “Divino Afflante Spiritu” absolutely delivers on that front. Heavy rhythm guitars are layered with eerie, at times tremolo-picked leads; placed over the basic, pounding rhythms, these elements unfold their almost primal, ritualistic potential. The subdued sections build up tension, which is in turn masterfully resolved when the band dials up the heaviness once again. One of the hardest things about writing instrumental music is to create a cohesive arc of suspense in your pieces to keep things engaging for the listener, but Labirinto prove their mastery in that field time and time again, this song being no exception. If what you heard above was to your liking, do be a dear and drop Labirinto a like on Facebook, and check out their other material over at Bandcamp. Divino Afflante Spiritu is out February 2, 2019 – mark the date on your calendar so you don’t miss out on it, and make sure to pre-order for Europe here and digital here! Next Post22 - "You Are Creating"